To embellish an object for everyday use: a CRYSTALLIZED™ Swarovski Element. A pencil become a jewel. Complete range of writing items, customizable and decorated with original and certificated CRYSTALLIZED™ Swarovski Elements. 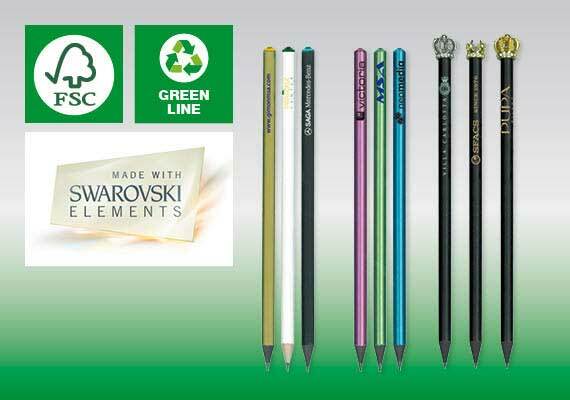 Brilliant pencils available in new metallized finish! Metallized pencil personalizzabile and decorated with CRYSTALLIZED™ Swarovski Elements! 5 standard colors on stock. Crystal colour combined with pencil colour. A pencil for the king and for the queen. A new pencil decorated with CRYSTALLIZED™ Swarovski Elements, embellished with a precious and brilliant crown in three models. European production in accordane with DIN EN 71/3 rule. FSC and REACH certificate.